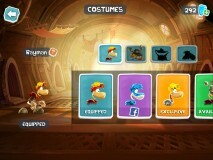 Rayman Adventures is the third Rayman game on the mobile platform in recent times after Rayman Jungle Run and Rayman Fiesta Run. 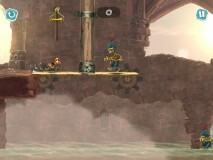 With this game, Ubisoft has made slight changes to the core gameplay, which was unchanged between the first two games, to give the player more control. 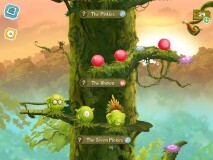 There are also some new gameplay elements, such as the Incrediballs, which are collectible companions that also assist you in gameplay. The first two Rayman games were more of an on-rails experience, where you had no control over the movement of the character who moved automatically and all you could do is jump or attack. With Adventures, Ubisoft has given some control back to the player and now you can change direction and go back if you missed something. This is still not the fully manual movement that we see in the console version of Rayman games but it's better than nothing. The control scheme has also changed. 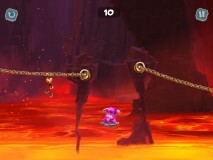 In the previous games, one side of the screen could be tapped to jump and the other for attack. In this game, you change direction by swiping in the opposite direction you are going in. You can tap once to jump and you can swipe in the direction you are going to attack. 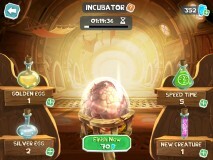 The game also introduces the Incrediballs. These are tiny creatures that you collect as you play and unlock more levels. There are multiple types of Incrediballs, and within each there are three types of varying power. In the first game you were pretty much entirely on your own. In Fiesta Run, you could use special abilities that helped you in the game. The Incrediballs are kinda like that. Each has a different ability. The green ones can find hidden treasure (up to three in a level) in the level and point you towards it so you don't miss them. The blue ones attract lums around you like a magnet. The red ones will protect you against one attack and then temporarily make you invincible. Before the game starts, you can use one or more of these to help you. You can use multiple ones of different type for different needs or multiple ones of the same type. For example, having more than one of the blue Incrediballs will attract lums more strongly. The Incrediballs serve as a nice addition to the gameplay. They are not compulsory and you can finish any level without them, however, some levels are made a lot easier if you have a certain type of Incrediball with you and some levels absolutely need one if you want to perfect the level by completing all objectives. The game highlights at the beginning which ones you will be needing for that particular level. Of course you can't just use as many as you want. Only a few are available to you and if you want more you will have to feed them, and as you can guess, the food itself is also limited. This would be a good time to talk about the in-app purchases. 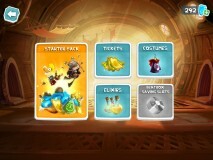 Unlike the first two games, Rayman Adventures is free with IAP. 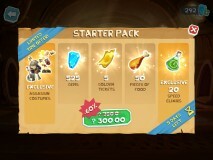 You can spend real money in game to purchase items such as food, gems (used for purchasing in-game items), potions, etc. 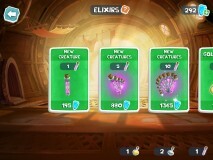 Admittedly, not once did I feel like the game was pressurizing me to spend money and you can play the entire game without spending a cent on it, without being punished in any way. 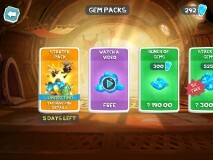 There is no advertising normally, but if you want you could optionally watch a video to earn free gems. I'd have still preferred a fully paid game with no IAP, but as far as having IAP goes, Ubisoft has done a good job here. But is the actual game fun? Well, yes and no. Yes because this is a classic Rayman game, which means the same frantic combat and platforming sections, the same amazing character animations and the same great level designs. Unfortunately, the major issue here are the controls. Having swipe and tap gestures for attack, change direction, and jumping is utterly confusing. Even if you do get over the learning curve, the game itself confuses your inputs several times, jumping when you wanted to attack and vice versa. It cannot be stressed enough just how frustrating this is when it happens. Rayman games often have amazing flow to the action, with everything placed where it should be for a quick and clean gameplay. Constantly confusing between the controls breaks the flow and makes you want to throw out your phone or tablet several times. This was not at all an issue with the previous games, both of which played beautifully. The addition of movement change in this game comes at a terrible cost and makes the feature not at all worth having. What this game needs then is a physical controller. Unfortunately, the gamepad support is missing at launch on both the iOS and Android versions. The item is listed in the Settings but all it says is Coming Soon. Thankfully, the one aspect of the game that hasn't degraded is the visuals. The game still looks amazing, with beautiful levels that come alive on high resolution displays, amusing character design and wonderful animations. The sound is great too, with the trademark Rayman whimsical tunes and characters noises. There are some hiccups occasionally but the game runs at a smooth 60fps on both platforms. 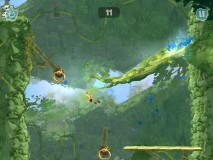 The game runs at native resolution on iOS, even on the Retina iPad, but is upscaled from a lower resolution on Android. There are a couple of issues worth noting, though. The game downloads additional data in the background on both platforms and you have no idea how much data it is downloading. It also occasionally stops to check for network connection if it doesn't detect any and can freeze for a while trying to reestablish connection. The game save sync system is also absurd. Instead of using iCloud or Google Play Games backup on the respective platforms, it instead backs it up on its own servers, and then makes you note down a code and type it into another device to sync the progress. You'd think this is to sync progress across iOS and Android, but that doesn't work and it is still platform specific. Lastly, the Android version has a horrible delay when you launch the app, and it shows a blank screen for nearly a full minute after you launch it, whereas the iOS version starts instantly. 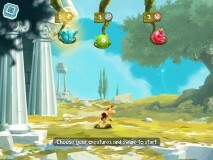 Rayman Adventures had the potential to be an incredible game, just like its predecessors. Unfortunately, the confusing controls take a lot of the fun out of the gameplay and makes it frustrating at times. This is one game that begs to be played with a controller but unfortunately won't let you do that at the moment. Still, having to use a controller is not a great thing for a mobile game, which is unfortunate as there really is a great game underneath those terrible controls.